A paper distributed in TheEuropean Physical Journal H delivered the first English conversion and an examination of one of Albert Einstein’s little-known papers, “On the cosmological problem of the general theory of relativity.” Issued in 1931, it structures an overlooked model of the universe, while disproving Einstein’s own formerly static model of 1917. In this paper, Einstein presents a cosmic model in which the universe experiences an expansion tracked by a contraction. This explanation contrasts with the monotonically getting bigger universe of the generally known Einstein-de Sitter model of 1932. The writers, Cormac O’Raifeartaigh and Brendan McCann from the Waterford Institute of Technology, Ireland, offer perceptions into Einstein’s vision of cosmology. At that time, the first bits of indication for an expanding universe arose, among others, reducing from Hubble’s explanations of the growing universe. Einstein was profound to examine whether a relativistic model could reason for the new explanations, by eliminating the so-called cosmological constant presented in his 1917 cosmological model. Einstein sets the constant to zero. He then reaches at a model of a universe that first inflates and then contracts. This model is also considered by singularity-like activities at both ends. In this paper, the writers also debate Einstein’s opinion of problems such as the curvature of space and the timespan of the enlargement, while also revealing some irregularities in Einstein’s calculations. For instance, they focus on a numerical error in the calculation of the current radius and matter density of the universe. They also consider that Einstein’s approximation of the oldness of the universe is founded on a doubtful calculation of Friedmann’s examination of a relativistic universe of sphere-shaped curvature and time-varying radius. Lastly, they discuss that Einstein’s model is not periodic, conflicting to what is often appealed. The image above in the page indicates Seyfert's Sextet that is essentially only four relating galaxies, though. Close to the center of this Hubble Space Telescope picture, the minor face-on spiral galaxy deceits in the distant background and appears only by chance ranged with the central group. 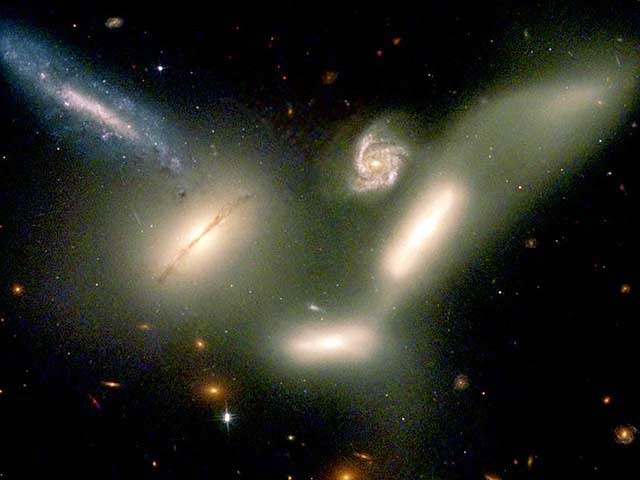 Also, the projecting concentration on the upper left is likely not a distinct galaxy at all, but a tidal tail of stars threw out by the galaxies' gravitational connections. Around 190 million light-years away, the interacting galaxies are strongly packed into a area around 100,000 light-years across, similar to the size of our own Milky Way galaxy, creating this one of the densest known galaxy clusters. The group may merge into a single huge galaxy over the next few billion years.